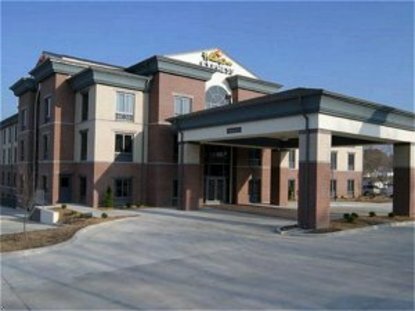 The award winning Holiday Inn Express Salem is centrally located to visit the Ozark National Scenic Riverways and Current River. Montauk State Park provides great trout fishing on the Current River. The karst topography in the area makes Salem central to the springs and caves of Missouri. Within an hour are Montauk Springs, Round Spring, Pulltite Spring, Welch&regs Spring, and Alley Spring. The small town hosts a variety of activities such as shopping for antiques, fishing, hiking, camping, and golfing. Nearby businesses are US Foodservice, Doe Run Recycling, Royal Oak Charcoal, and U.S. Forest Service. SBU Salem campus is a satellite campus, which offers a Bachelor&regs degree in a limited number of majors. The exciting SCAA Road Rally has been held in February in Salem for a number of years. Flat Nasty now provides extensive trails of off-road adventures. Winner of the coveted 2005 Newcomer Award, and 2006 and 2007 Torchbearer Award, the hotel provides a warm, friendly hospitality with guest comfort first and foremost. The Holiday Inn Express Salem has 65 spacious rooms, an indoor pool and spa, fitness center, free high-speed Internet access, elevator, interior corridors, 1800 sq ft of meeting space, and catering facilities. Our complimentary breakfast includes biscuits, gravy, and bacon, as well as an offering of a continental fare. Tax rate of 8.725%. Stay Smart at the Holiday Inn Express located in Salem, the county seat of Dent County. This hotel is committed to providing accessible facilities under the American Disabilities Act. If your accessibility needs are not met, please contact the Hotel Manager on Duty. Should you require additional information regarding accessible facilities for guests with disabilities, please call 1-800-Holiday (U.S. and Canada) or contact the hotel directly. For the hearing impaired, TDD service is available at 1-800-238-5544 within the U.S. and Canada.